Indian Intercity bus segment with an estimated volume of around 5000 to 6000 units haven’t moved forward for quite sometime. While the action is very hot in the premium category there isn’t anything happening in the economy and value segment. 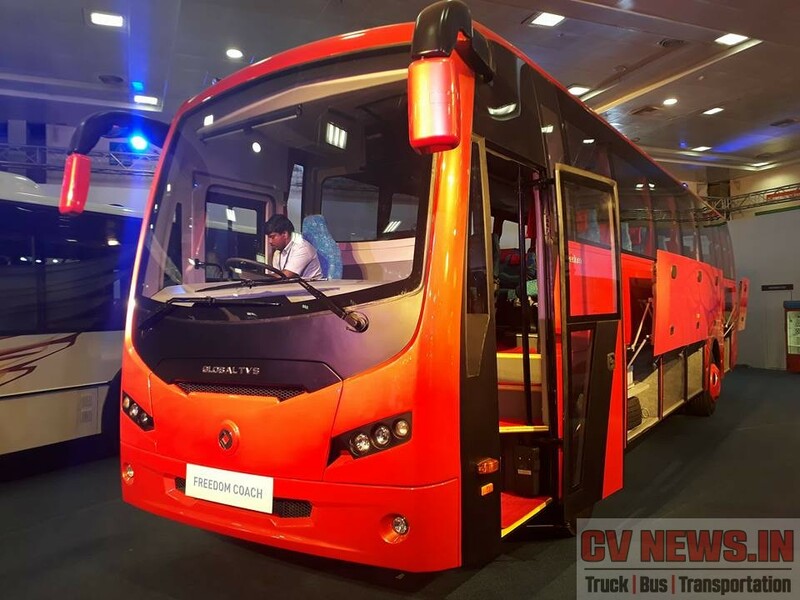 Post BS IV implemention, there are couple of products like 160hp power node in economy segment is vacated by Ashok Leyland, and moved the game to 180hp and above. But anything above 230hp till 320hp there isn’t any products available. Here we present a case on how a new “Value segment” positioned between Economy and Premium category can work effectively for both manufacturers and Customers. 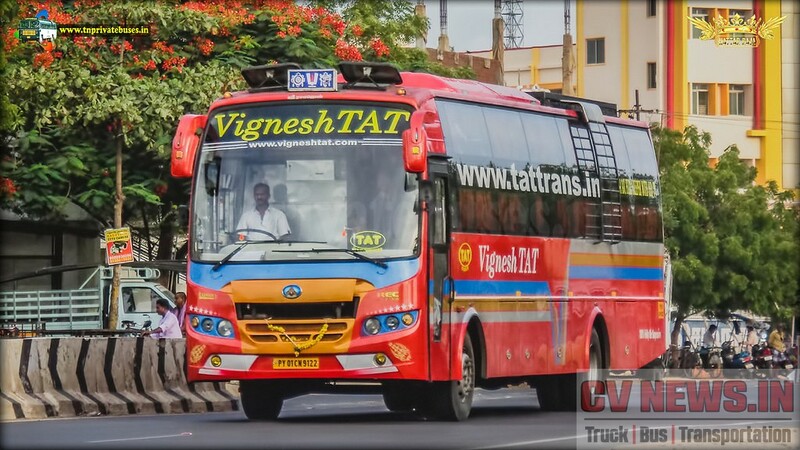 This segment has a volume of 5000 to 5500 buses per annum and is dominated by Ashok Leyland with Viking and 12m, followed by Tata with 1512/1515 and 1618. These buses operate mostly with in the distance of 450 Kms to 600 Kms and are very strong in Tier II and Tier III routes. Though these are prime application there are cases of these buses operated in ultra long distance routes like Bengaluru – Jodhpur for a distance of close to 2000 Kms one way. 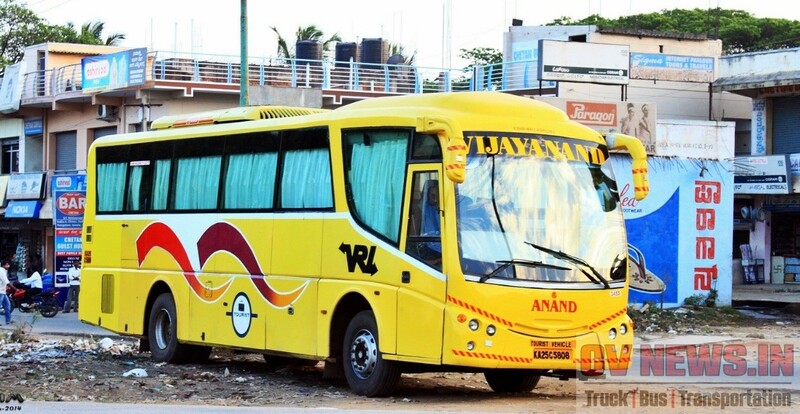 Apart from Intercity application, these buses are very popular in tourist application for a trip distance of 350 kms to 800 kms used for a trip of 2 to 5 days. Markets like Kerala and Delhi are still dominated with these buses and are very economical to operate as well. Chassis sale is predominant here and body built by third party body builders like SMK Prakash, Sutlej, JCBL located across India. With in this front engine bus segment, now a new segment, which is primarily catered by Fully built versions are emerging. Options like MAN – MG Mammoth, Ashok Leyland Freedom, Tata Magna and BharatBenz 1623 are available currently. The price for these coaches are anywhere between 50 lks to 55 lks inclusive of body (though a split billing is done). Of the above lot, excepting Mammoth none of the coaches have hit the road. 4 Nos of Mammoth purchased by KPN will be commissioned shortly. Similarly BharatBenz has sold couple of chassis in Kerala and body is getting built at Prakash, Bengaluru. A segment unheard in India, till Volvo entered India in 1999. While Volvo has set the base, established and created a segment, other European manufacturer’s like Scania, Mercedes Benz landed in India to take a pie out of the minuscule this volume. Estimated volume in this segment is between 650 to 700 nos annually. This segment isn’t growing for last couple of years, due to various issues like higher tax structure, permit issues etc. The multi axle coaches dominate the Intercity segment, the single axle coaches are finding their space in few STU’s and tourist applications. In cities like Delhi, prominent Tourist operators like Souther, Panickar travels own and run multi axle coaches. There was a complete sweep towards multi axle coaches in the intercity segment in high TIV areas like West and South primarily because of increased revenue they bring. Today 15m coaches are common running in routes like Cochin – Hyderabad. Volvo is still a dominant player but Scania is doing wonders in sales especially in markets like Kerala, where more than 70 coaches are running and operated to Kerala. Scania is now moving the market to a different level by working on alternative fuels like Bio diesel. 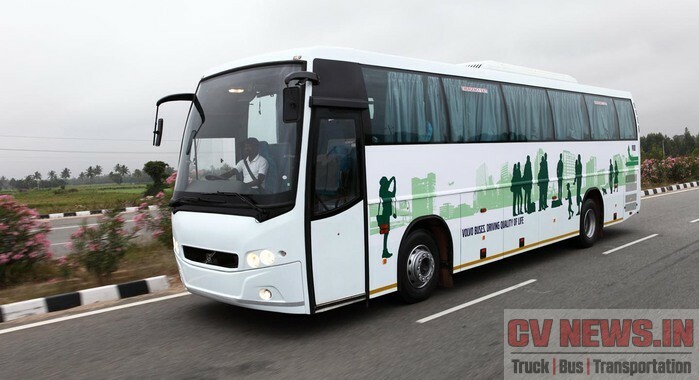 Infact commercially Scania has launched buses that run in Bio-diesel and are operated by KaSRTC. Work is on, in sleeper options in this category too. While Volvo is busy selling Multi axle chassis to SM Kannapa for making sleepers, Veera is building a sleeper coach over Mercedes Benz chassis. As sleeper bus regulation AIS 119 is now passed, Sleeper is the next move in this segment too. Between the economy and premium segment, there exists a Value segment which is completely untapped by bus manufacturers. This is not a complete new segment, infact we had seen options like Isuzu – LT 134, Corona, Tata Divo, Ashok Leyland Luxura / 12M RE in past. Isuzu had an excellent start but due to poor reliability of the product, it was out of market in less than 5 years. Isuzu in its haydays, was consecutively selling 40 to 45 units per month. Isuzu did crack STU markets in Andhra Pradesh, Himachal Pradesh and bagged large orders from operators like VRL Logistics but failed to continue the momentum. Corona could be termed as successful with a limited boundary of Karnataka STU’s, they didn’t look anything outside excepting few sales limited to Chennai based Parveen Travels. The come back by Ashok Leyland with 12M RE had seen modest success and were operated in prime routes like Mumbai – Bengaluru as sleeper. Ashok Leyland was able to sell close to 50 units of 12M RE in a span to 2 years but still the company didn’t take it forward. With Divo limited to very few numbers, it wasn’t a great attempt by Tata motors. 9100 by Volvo was a right approach by Volvo and was looked as a strong entry barrier to Indian manufacturers. The product was reworked from B7R platform with key changes in aggregates. The Coach had enough cost cutting that even motorised rear view mirror wasn’t provided. Number of luggage compartment doors were reduced, overall length was reduced to 11m and it did find enough takers. It was retailed at around 70lks, but due to various cost factors the product is now officially discontinued. While we have seen most of these products vanishing Indian market (except Corona), the space is still vacant and has enough potential to create a volume for itself. 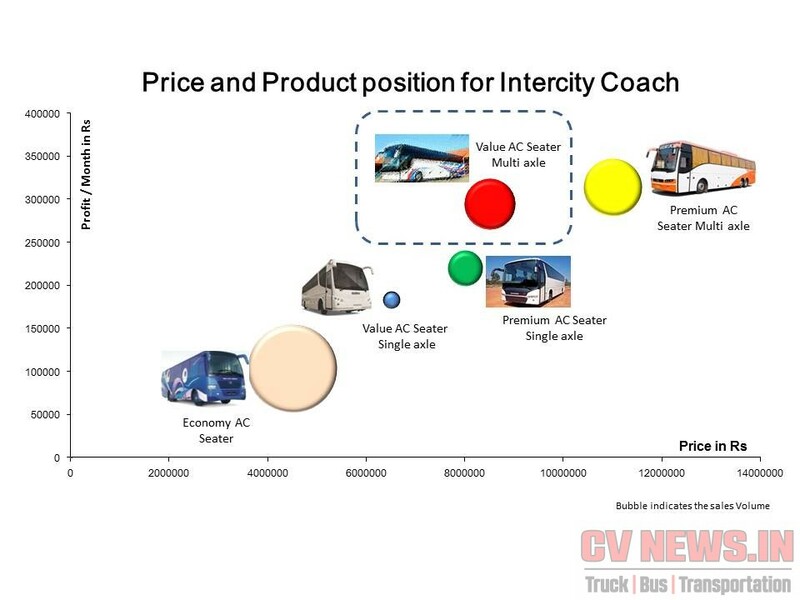 The price and product positioning shown below will clearly explain how a rear engine value multi axle coach, with a price band of 80 lks to 85 lks will be a great value to Customer. This segment TIV is estimated to have a volume of min 550 nos to 700 nos will further trigger, if the product meets the key buying factors of the Customers. Important Key buying factor’s are availability, passenger comfort, lower maintenance cost and these factors are to be addressed without compromise. Along with better availability, the fuel performance is also a prime factor and flips sales largely. While Premium Multi axle coaches deliver anywhere between 2.5 to 2.7 Kmpl with a engine power of ~400 hp, the value coaches shall be mandated to deliver over 3 Kmpl with a power rating of 300 to 350 hp. Disclaimer : Working is done for Bangalore – Mumbai route with key inputs on fuel performance, maintenance cost, resale value and demand from passengers. Brand value plays a major role in key user factor and its upto manufacturer to create a brand value for the bus. Its to be noted that, selling a bus to Intercity segment is more than a B2B sales and brand awareness to passenger does play a role, if not majority but to a significant level. Today Volvo is a ticket brand – means people travel by choosing a brand of choice. Now with more options available, the choice is a Scania or Volvo or Merc. Though this is limited to high TIV areas and in Tier I routes, it decides the purchase of fleet Operator. Tata showcased Paradiso G7, in Auto Expo 2012 and was very effective and bold move by Tata, inspite of the fact that Tata has limited market share in Intercity economy front engine segment. Paradiso G7, as per its specification stands shoulder to shoulder with European players, but differential pricing was a key. Now post BS IV, the driveline is under validation and we wish the coach is launched soon (though no official voice from Tata). Ashok Leyland has been working on Multi axle coach for quite some time and their Business Heads had quoted this in various interviews. 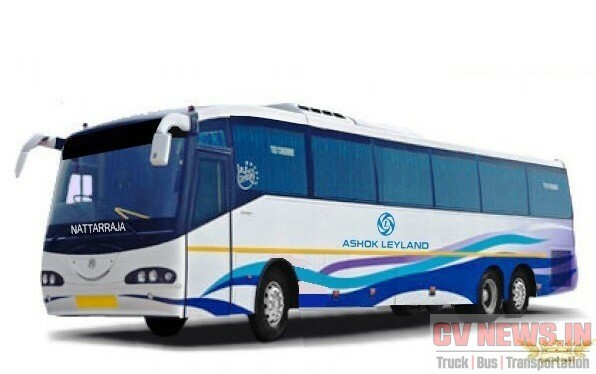 By having a leadership in economy intercity segment, Ashok Leyland should work towards Value multi axle segment. By doing this, Ashok Leyland can migrate a considerable volume from bigger pool of economy segment and also bring back their lost Customer’s who have switched to premium products like B11R and Metrolink. By making it more value for money for both Customer and Passengers, Ashok Leyland can retain its loyal customer’s and prevent them from shifting to premium segments. Also with sleepers getting hot day by day, the new coaches shall accommodate the requirements of sleeper coaches like larger and uniform window aperture, uniform head room for all passengers, lower upper berth height to reduce passenger roll during coasting etc. As coaches are often engineered for a seater now we may require a validated sleeper body as well. Hopefully we see this segment getting kicked off and see the volumes coming in.